Scorp-ion has been conceived as an environment-friendly car: with a green identity it is a 2-seater, small in size and projected to be fully-electric. Set up participate for the eighth year running at the Geneva Motor Show, IED Turin has unveiled the first sketch of its project for this year's edition: Scorp-ion, an environment-friendly concept car designed by the students of the Master of Arts in Transportation Design 09/10 course and which has been constructed in cooperation with Abarth. For the 81st edition of the Motor Show, IED has aimed to interpret true essence of the Abarth marque, distinguishing it from the Fiat brand with which it is often identified, through the vision of a quartet of budding young car design students. How to express the spirit of Abarth, renowned worldwide for compact, intelligent, record-breaking sports cars? IED Turin says it has responded with Scorp-ion. Scorp-ion (length 4010 mm, width 1905 mm, height 1192 mm AND wheelbase 2350 mm) seeks to embody Abarth's specific characteristics with a combination of sporty looks and reduced dimensions. 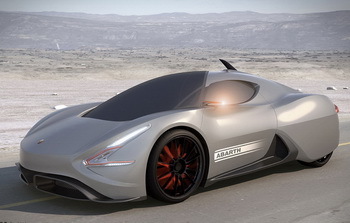 However, the concept oversteps any current scheme of the production range and is instead projected towards the potential future of the marque, and is thus according an extreme vision of Abarth's identity and character. Scorp-ion has been conceived as an environment-friendly car: with a green identity it is a 2-seater, small in size and projected to be fully-electric. Positioning of the lithium battery, from which the car takes its name Scorp-ion (from the English 'ion' and Abarth's nickname) under the load compartment behind the seats would promote maximum rationalisation of space. The engine is envisioned being de-located to the four wheels in order to exploit the interior space to the full; the very low centre of gravity of the vehicle promotes maximum performance and efficient driving while the two-seater configuration endows the vehicle with a generously-scaled luggage compartment. Overall, the concept recalls the lines of the scorpion – the icon of the Abarth marque – and has been designed with particular attention to improving vehicle aerodynamics, also through complete covering of the real wheels. "It’s always exciting," says César Mendoza, Director of IED Turin," and also a source of a particular apprehension to know that our school participates each year at the Geneva Motor Show without having a definitive vision, from the outset, of the project we will present; a vision that is gradually refined and takes shape once the concept has been completed by the students. It is this silent confidence in our students and which exists among the school, lecturers and students that underlies the professional growth of each single designer. The concept premiered this year is already a source of great satisfaction as it has provided us with the opportunity to carry out research into a great Italian marque, its character, also considering the use of alternative sources of energy. This study has encouraged our students to conceive bold, innovative styling and volumetric solutions." Scorp-ion is the offshoot of the work of seven students of the Masters' course coordinated by Luca Borgogno, Senior Designer Pininfarina, and Luigi Gimapaolo, Designer Maserati. The Master of Arts in Transportation Design – work experience is a highly qualified, two-year course intended to train competent automotive professionals able to approach the world of work through a constant rapport between companies and styling centres. The new concept car project is in fact the result of a process comprising various phases of assessment that simulate a real working situation: starting from the seven design proposals submitted, all the models have been reproduced in clay in 1:4 scale, subsequently selecting that which complied most effectively with the initial brief of the company. The entire class, working in groups, then worked on the project selected to complete all the internal and external details of the concept. The Scorp-ion project stems from an idea by Turkish student Emre Husmen, he was joined by Alexandre Goloskok (Russia), Aydar Nigmatullin (Russia), Maksym Shkinder (Ukraine), Karla Dennis Soriano Farfan (Mexico), Chrysanthos Therapontos (Cyprus) and Marcos Villalon (Argentina) in completing the concept car which has been constructed by Cecomp while there has been cooperation from Pirelli and OZ Racing.